Card is used but has been tested to confirm that it works as expected - see screenshots below. In summary, AudioScience cards are the defacto standard for multichannel broadcast use. 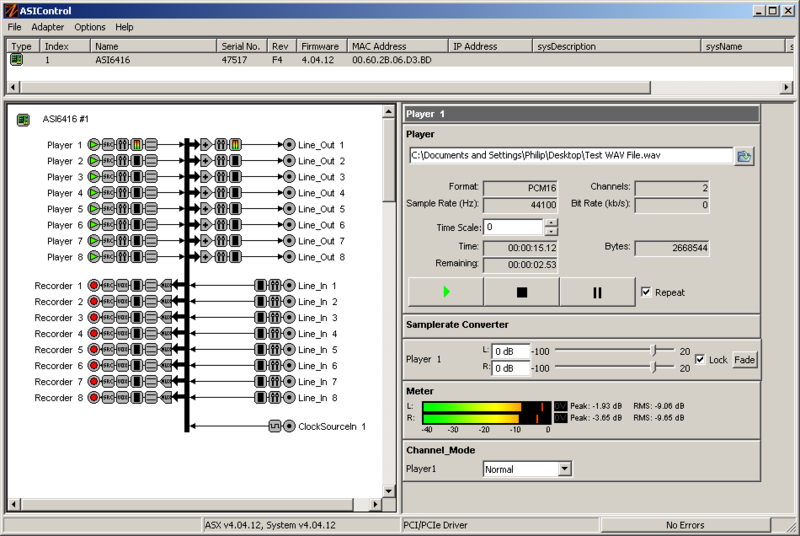 They are supported by most of the main playout and automation software packages straight out of the box and allow each output stream to have its own independent channel with the level controlled either by the software or by the fader on the console. 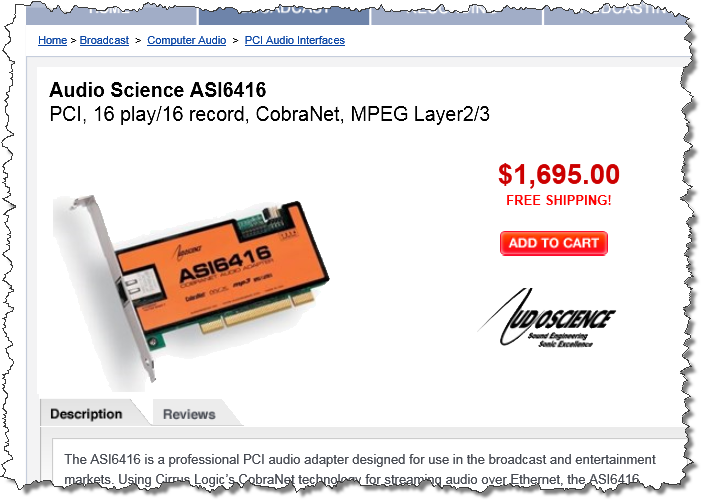 The ASI6416 is a professional PCI audio adapter designed for use in the broadcast and entertainment markets. Using Cirrus Logic’s CobraNet technology for streaming audio over Ethernet, the ASI6416 provides 8 stereo inputs and outputs. It can be connected to any CobraNet compliant device. The ASI6416 is based on the TMS320C6713 floating point DSP connected to a high speed bus-master PCI interface. AudioScience MRX technology allows up to 16 streams of different formats and sample rates to be played, recorded and mixed over CobraNet. A choice of 16bit PCM, MP3 or MPEG layer 2 compression is available on all streams. 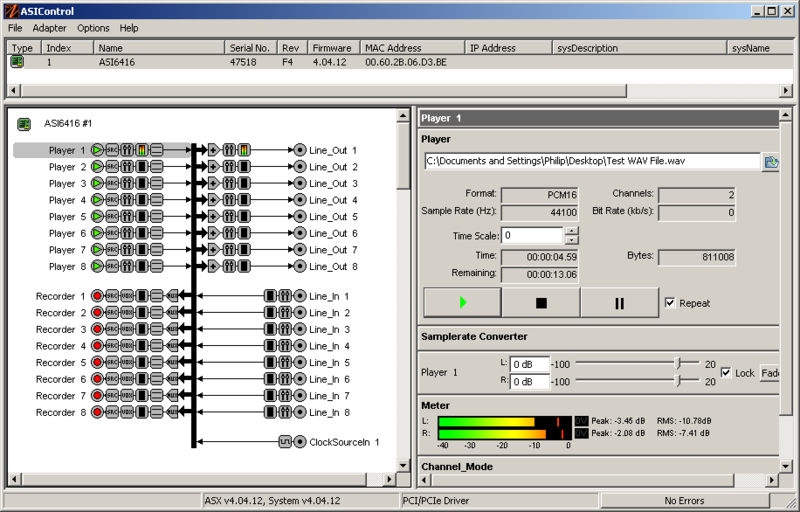 AudioScience provides ASIControl, an application that allows CobraNet routing connections to be setup between the ASI6416 and any other compliant CobraNet device on the network. Alternatively, 3rd party CobraNet design and management software may be used such as CobraCAD from Cirrus Logic or CobraNet Manager from D&R Electronica B.V.